The popular television show ‘Ata Pattama’ recently featured Vietnam and the infamous ‘Chu Chu’ tunnels and described how the Vietnamese dug underground tunnels to travel over 100 kilometres in a bid to fight the Americans who had invaded their country. It showed the Vietnamese soldiers on bicycles and fighting the ‘mighty’ strength of the invading forces who retaliated with carpet bombings and other internationally banned modes of weaponry. Other than a few critical media reports, no human rights violation investigations were initiated by the United Nations, Britain or any other party. Leaders of Iraq and Libya, Saddam Hussain and Mohamed Kaddafi were labelled as terrorists and invasions were made and justified against these two countries, resulting in the killing of scores of innocent civilians in remote villages, including women, elders and children who did not even have the strength to hold a gun. Other than a few critical media reports, no human rights violation investigations were initiated by the United Nations, Britain or any other party. Almost every week, one reads of US helicopters bombarding Afghanistan and Pakistan, killing innocent civilians in remote villages. Other than a few critical media reports, no human rights violation investigations were initiated by the United Nations, Britain or any other party. Back home, LTTE terrorists used claymore mines, bombs, swords and knives to chop to death innocent civilians in remote villages including women, elders and children. To write about such brutalities committed by the LTTE against their own brothers and sisters, the pages of the Sunday Observer are not enough. President Mahinda Rajapaksa, very effectively captured the situation, when he said in a recent interview: “For others it was news, for us it was agony”. Eighteen years ago, the LTTE, with the intention of destroying Sri Lanka's economy and to trigger a retaliatory attack on Tamil civilians, drove an explosives-laden truck to the Central Bank and exploded it, killing scores of civilians and injuring thousands, and also causing millions worth of property damage. 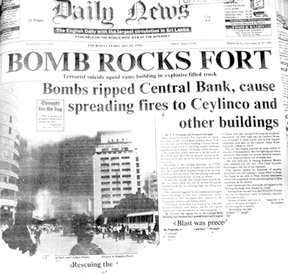 January 31, 2014 marked the 18th anniversary of this dark day and the Central Bank held a commemoration ceremony. Governor of the Central Bank, Ajith Nivard Cabraal recalled the physical damage that was caused to the economy and the well-being of the people and the impact it had on the Sri Lankan economy. He also praised the maturity and calmness of Sri Lankans in reacting to the terrible tragedy. The immediate response of the Central Bank in the aftermath was discharging its responsibilities, particularly the payment of local and foreign debt due on that date. During the time, what irked most Sri Lankans was that many countries were turning a blind eye to open fund raising by terrorist-backed groups, the diaspora and NGOs, which helped fund the terrorist activities. In the backdrop of all this, it is unfortunate that the heroic efforts of the Sri Lankan Armed Forces to rid the country of terrorism and the brave political leadership in the well co-ordinated effort to deal with terrorism decisively, even while there were covert and overt support for terrorism in Sri Lanka from unexpected quarters are not being appreciated by some. 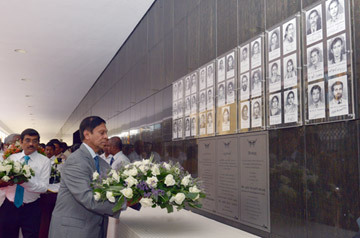 The CB Governor recalled that the end of terrorism marked the biggest-ever hostage rescue mission in the history of the world where around 300,000 civilians who were held hostage by the LTTE were rescued in the first half of 2009 and brought to safety. These persons suffered untold misery, being driven from different parts of the Northern Province to the eastern coast of the Northern Province by a brutal terrorist leader. However, due to the valiant efforts of the Sri Lankan Forces, these persons were rescued and cared for. In this regard, it must be noted that as soon as various LTTE flanks that were holding these civilian hostages were breached by the Sri Lankan Forces, the civilian hostages moved en masse towards the Armed Forces, thereby unambiguously confirming that they viewed the Armed Forces of Sri Lanka, not as their aggressors, but as their saviours. In a bid to bring back normality, the Sri Lanka authorities de-mined thousands of square kilometres of land, and removed about 1,000,000 explosive devices before the resettlement of the rescued civilians could take place. At that time, many in the international community believed that this de-mining operation would take more than 10 years to be concluded. However, the Sri Lankan authorities and Armed forces, assisted by several international agencies, were able to substantially complete this massive task in less than three years, thereby paving the way for the civilians to be resettled in their own homes and villages in no time. The huge task of resettling the civilians, who had been rescued and accommodated in temporary villages with basic comforts, was successfully carried out by the Sri Lankan authorities. "Here too, many international observers were of the view that Sri Lanka would perhaps take more than 10 years to complete resettlement. However, within three years, almost all 300,000 civilians have been resettled in their homes, according to UN standards." A massive rebuilding effort was carried out immediately after the end of the operation, to rebuild, restore, and enhance the infrastructure that had been damaged and/or destroyed. "Today, these areas enjoy levels of infrastructure which is not second to that in any other part of the country. The massive public investment that was needed for this purpose was generously provided by the Government, over three billion US dollars in within four years." "About 12,000 ex-LTTE cadre who have been responsible for murders, bombings, kidnappings, extortion and other crimes and who were under arrest, and in the custody of the Government, together with over 500 child soldiers who were rescued from the clutches of the LTTE, were rehabilitated within a short period of time and set free, and allowed to reintegrate with society." This gesture is one that is unprecedented after a major conflict, and is completely contrary to what has taken place in wars where Western powers had been involved, where "enemy" combatants had almost always been incarcerated, hunted down mercilessly, or sentenced to death or life imprisonment," he said. "This unprecedented gesture of releasing ex-combatants was one that was highly sensitive and risky, because the danger of a recurrence of violence was always a possibility." Perhaps as a consequence, not a single incident involving terrorism has occurred in the Northern Province or any other part of the country since terrorism ended in May 2009. "This outcome is a compelling lesson for the so-called "victors" of other wars, particularly in Iraq, Libya, and Afghanistan where many years after their war "victories", fresh acts of violence, bombings and horror continue each day, and affect the people of those nations." Together with the restoration of normality and the emergence of conditions that provided space for political dialogue and discussion, the Sri Lankan authorities conducted Presidential and Parliamentary elections, Local Government elections and Provincial Council elections in the affected areas. The restoration of the infrastructure as well as banking and other financial services enabled the people to establish their livelihood opportunities. Today, the economic growth that had been experienced in these areas is nothing short of incredible. Sri Lanka established a Lessons Learnt and Reconciliation Commission (LLRC), within just one year after the end of terrorism, which was much quicker than the time it took South Africa to establish its own Truth and Reconciliation Commission. Unfortunately, there is now a huge effort by certain countries where the Tamil Diaspora is present and active, to turn the 'victim' into the 'accused'. These propaganda and political efforts are supported and funded by those who earlier funded terrorism and the obvious double standards that are being applied by certain countries unabashedly, is clearly unhelpful to the sustenance of a lasting peace in Sri Lanka." The millions who suffered and who are today enjoying normal lives must make their voices heard. The new responsibility of all Sri Lankans must be to convey the message that Sri Lanka has the means and the intention to resolve its own issues in a lasting and sustainable manner, Cabraal said. All Sri Lankans have to meet this fresh challenge, by creating awareness in all parts of the world and among the countries who are truly friendly towards Sri Lanka, as well as in the few countries whose political leaders have chosen to be hostile mainly due to the intense propaganda and political work of the Tamil Diaspora." "Sri Lanka must do all it takes to ensure that this type of tragedy and the events that led to such a situation never occur again." Sri Lankans must forgive, but never forget those who encouraged, trained, funded and supported the tragedies in Sri Lanka.